Thankfully we’re also saved from another social realism treatment of the subject. 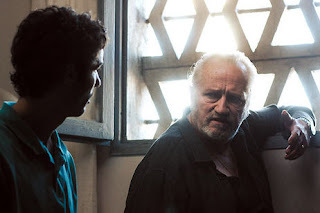 Unlike the over praised ‘Gomorrah’ Audiard mixes his prison grittiness with an assured cinematic flare. Freeze frame intertitles which tell us who the characters are, and introduce specific chapters of the story, serve no other purpose than for style; Audiard shows us a number of arty subjective dream sequences revealing Malik’s self-doubt; and a number of carefully placed but not overused songs add the right amount of pop culture anchoring as well. Unfortunately an opportunity to send the film into the stratosphere is missed with an ill-chosen ironic Mac the Knife cover by Jimmie Dale Gilmour, which takes the film into the credits. I couldn’t help but think of the effectiveness of Sid Vicious’ ‘My Way’ or Moby’s grandiloquent piano outro from ‘Heat’ or ELO’s ‘Living Thing’ from ‘Boogie Nights’, which ended those films with authority. ‘Un Prophet’ unfortunately goes out with a wink instead of a bang. Oh well, its not enough to reduce the power of Audiard’s crime masterpiece. Look out for “Un Prophet”, as a foreign language film, to possibly make a rare dent into North American theatres.